Bettair® was born for a single, simple reason: to help provide the solution to the world’s growing air quality problem. Bettair®, a spin-off of Ateknea Solutions, is a Platform as a Service (PaaS) that allows cities, for the first time, to map air pollution on a previously unimaginable scale, based on a large deployment of outstandingly accurate gas sensors by using an advanced post-processing algorithm. The need for a new solution to measure urban air quality is clear. More and more people live in cities globally – over 50% of the world’s population – and air pollution is fast becoming a public health emergency across the world. However, the traditionally used air pollutant analysers are relatively large, heavy, and expensive, with prices ranging between €5,000 and €30,000 per device. Bettair® is a network of autonomous devices that are installed in streetlights (or in city furniture) in a dense matrix distanced between 0.5 km to 1 km, allowing a high spatial and temporal resolution. This information allows urban planners to make appropriate urban plans to improve air quality and to take smart and better decisions to mitigate air pollution. 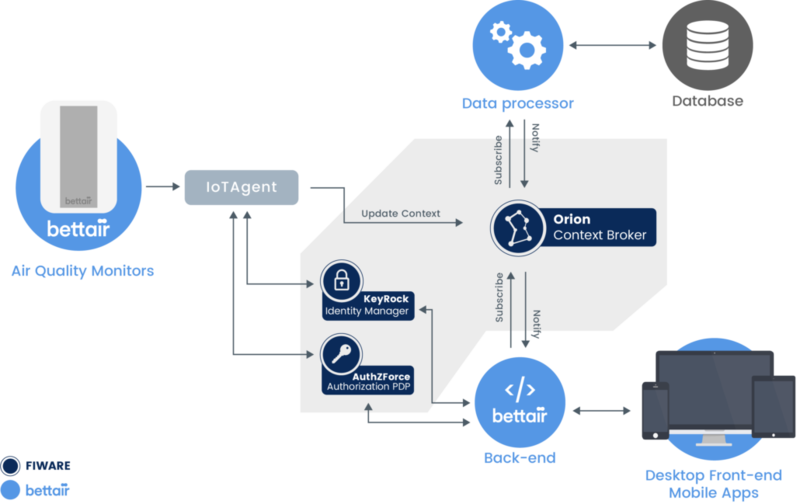 How Bettair’s network system works with the smart solution platform, FIWARE. Currently, electrochemical sensors are known to have low accuracy when compared with traditional air quality monitoring equipment. This is a primary reason why cities still rely on monitoring systems that do not provide an accurate representation of urban air pollution. After years of research, Bettair Cities has developed a robust processing algorithm that, combined with customized hardware, achieves high accuracy. To prove this, Bettair carried out a study in which Bettair nodes with three electrochemical sensors (NO2, O3, NO) were installed in the same location as an air quality monitoring station of the Generalitat de Catalunya, located in Barcelona. The main purpose was to compare the nodes’ measurements of NO2, O3, and NO with a calibrated reference instrument for a long period. After a year of in-field testing, the Bettair® system returned results that were consistently comparable with the traditional air quality monitoring stations with which they were co-located. Figure 1. Time series (left) and correlation plot (right) of 1-hour averages of Nitrate Dioxide measurements of one Bettair® static node compared with a ratified AQM station. Figure 2. Time series (left) and correlation plot (right) of 1-hour averages of Ozone measurements of one Bettair® static node compared with a ratified AQM station. Figure 3. Time series (left) and correlation plot (right) of 1-hour averages of Nitrate Oxide measurements of one Bettair® static node compared with a ratified AQM station. These are the most comprehensive results ever achieved for a modern, alternative air quality monitoring system, as they detail the system’s performance throughout the year, including the summer – which often proves the most difficult period to accurately measure, and which is seldom represented in results released by new air quality measuring systems. It is the first demonstration that low-cost air quality sensor networks can provide cities with high spatial and temporal resolution measures, which are essential for understanding and spatially monitoring environments with complex and highly variable emission sources, such as in urban areas. With these incredible results, Bettair Cities will continue to work towards providing a solution for mapping the world’s urban air quality in high resolution. For further details about how Bettair Cities works with FIWARE to solve the increasingly urgent global problem of urban air quality measurement, see Bettair CTO and co-founder, Leonardo Santiago’s full blog post on FIWARE’s website. FrontierCities2, a unique acceleration & innovation programme for FIWARE SMEs and start-ups, will help fund the development of FIWARE-powered smart-cities and smart mobility solutions in 45+ city environments throughout Europe. As one of the grantees of the frontierCities2 programme and a powered-by-FIWARE solution, Bettair is contributing to the generation of smart solutions for city environments across Europe by providing cities with a cutting-edge IoT platform that allows them to map air pollution on a previously unimaginable scale, at a fraction of the price. For the first time, an IoT platform will help improve air quality in cities, one of the most threatening problems faced by cities in Europe and across the globe. Want to learn more about FIWARE and how it’s helping companies like us develop cost-effective smart city solutions? Listen to Leonardo Santiago, Bettair’s CTO, talk about Bettair, FIWARE, and the benefits and solutions that they are bringing to society, from reducing air pollution to improving mobility, all on the FIWARE podcast: A fascinating discussion with Gregory Eve (GreenApes) and Justin D’Atri (AcoustiCity.io).